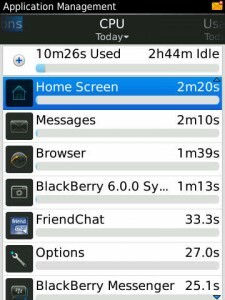 I have a blackberry 9900, my battery last about 4 hours. I have Facebook. whatsapp, twitter and wechat. After doing the following steps it was clear that twitter was using the CPU a lot more then the other applications, I went to twitter application in settings my phone was refreshing feeds every 5 minutes. I set it to 1 hour and now my battery lasts up to 40% longer. Click on the Wrench/Options on your main screen. Scroll the screen over to the right by one screen. The next screen should be titled “CPU”. I hope this post helps people !